Seeing is Believing This sample manual to teach Project Management: All You Need to Know is in MS Word format. This is a one-day course shows students how to manage those small- to medium-sized projects that they may encounter in the workplace, but they don't need to get a project management certification for. The skills are here for you to pass along to your class. 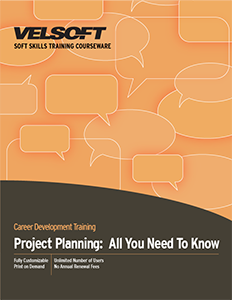 Students will get a look at how project life cycles and a project planning document. They will learn about executing the plan and a communications plan as well. The course covers changes and project tracking and status meetings. The course wraps with a consideration of how to close the project.